Professor Laetitia Rispel is a Professor of Public Health and DST/NRF Research Chair. She was the head of the School of Public Health at University of the Witwatersrand, Johannesburg. Her research expertise is in public health, specifically health policy and systems research (HPSR). She has published extensively in this HPSR field. Laetitia has more than 20 years combined experience of research, teaching, public health, executive management, and health leadership. Laetitia is a member of the editorial board of the international Journal of Public Health Policy. She serves on the Governing Council of the World Federation of Public Health Associations, where she chairs the Global Health Equity Work-Group. 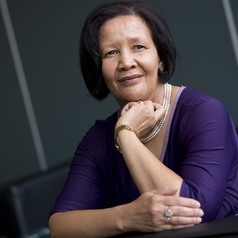 In January 2014, Laetitia was appointed as the vice-chair of the Board of the Office of Health Standards Compliance, a regulatory authority that will oversee and monitor quality of health care in South Africa. In October 2014, she received the vice-chancellor’s academic citizenship award for her contribution to the development and growth of the Public Health Association of South Africa (PHASA) and to the growth of the discipline of public health both nationally and internationally.